All transactions are safe and secure with a reliable history in online purchasing behind each of our associates. Buy the You Don't Win Friends With Salad t-shirt to own Simpsons clothing and merchandise. 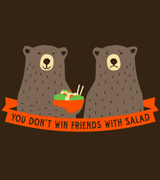 This T celebrates one of the Simpson's most famous quotes, "You don't win friends with salad." It is from the episode "Lisa the Vegetarian." Bart and Homer chant the quote during the episode, forming a conga line that Marge joins. This Simpsons t-shirt lets others know that you win friends in Springfield by cooking juicy steaks, not making salads. Wear it underneath an unbuttoned Pin Pals Simpsons bowling shirt. In addition to the You Don't Win Friends With Salad tee above, browse the Simpsons Clothing Gallery for more apparel like men's and women's clothes, kids shirts or hoodies.